This story is written by James McNair for the Kentucky Center for Investigative Reporting and is presented here with permission. Braving temperatures in the 30s on a recent Wednesday morning, the 25 or so people bunched in the Kroger parking lot in west Louisville had plenty of grounds for complaint. But complaining they weren’t. To the contrary, this group was stoked about the occasion. In just a few minutes, a large luxury bus would be pulling up and taking them on a free trip to the Horseshoe Southern Indiana Casino. For the next five hours they would be playing slot machines, eating $12 worth of food on the house and hoping to go home winners. One of the bus riders, Darlie Lowe, has been making the 12-mile trek to Horseshoe ever since it opened as Caesars Indiana in 1998. She’d rather the casino be in Louisville, where she lives. Many Kentuckians, of course, want the state to remain casino-free, and politicians have debated the legalization of casinos, in one form or another, for more than 20 years. But while Kentucky has hemmed and hawed, the three states on its northern border -- Illinois, Indiana and Ohio -- have gone all in. Together, they have raked in a total of $3.9 billion in taxes in the past decade from their combined eight casinos on the north bank of the Ohio River. And that doesn’t include taxes on hotel stays, food, concerts, golf and retail sales. 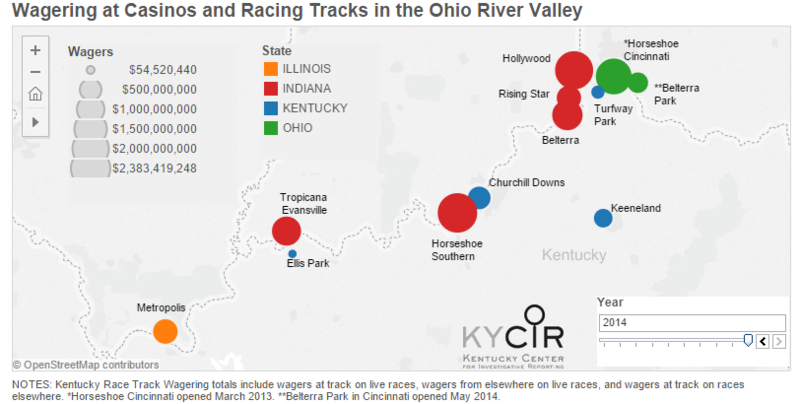 Compared to the casinos, Kentucky’s horse racetracks look like small-stakes operations. In the past 10 years, the five thoroughbred tracks and three harness-racing tracks sent $45.8 million to the Kentucky Revenue Cabinet. The eight offshore casinos produced about seven times that amount in 2014 alone. Horseshoe, with $81.5 million in tax payments in 2014, nearly doubled Kentucky’s 10 years of racing taxes all by itself. The paradox facing the Bluegrass State is that Kentucky residents are fueling those out-of-state cash gushers. Exactly how much would be pure conjecture, but based on the large numbers of vehicles with Kentucky plates in these eight opposite-shore establishments, Kentuckians have a fondness for slots, poker and other casino games across the river. Horseshoe, just a few miles south of New Albany, says 60 percent of its revenue comes from the Kentucky side of the Louisville metro area. “We know a significant portion of the revenues that are collected from the facilities in Ohio and Illinois and Indiana come from Kentucky residents,” said Michael Jones, a senior economist in Gov. Steve Beshear’s Office for Policy Research. The gross dollar amounts are even more stark. In the past 10 years, all the money plopped on game tables and spent on slot machines in the eight offshore casinos adds up to about $134 billion, according to the Kentucky Center for Investigative Reporting’s compilation of data from state gaming agencies. If Kentuckians account for 40 percent of that action, their share comes to $54 billion. At 25 percent, it’s almost $34 billion, an outflow of $3.4 billion per year. Again, just on the gambling alone. The potential economic impact of casino gambling in Kentucky has been studied ad nauseum. In one of the more recent studies, the Spectrum Gaming Group, a market research firm in Linwood, N.J., in 2011 projected $465 million in gaming taxes from the first year of casino operations at the state’s eight horse racetracks. Jones said annual tax receipts would level off once casinos reached “full operation” in their third year. 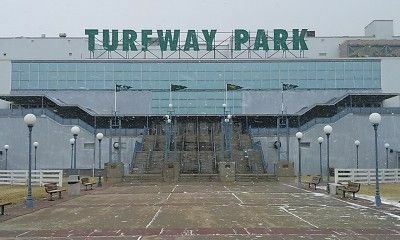 The double-shot of casinos from both Indiana and Ohio might have aggravated the decline of Turfway Park, the only horse racetrack in Northern Kentucky. 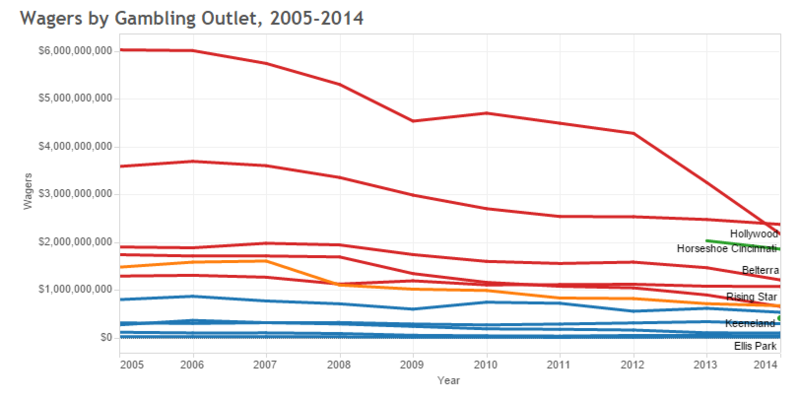 From 2005 to 2014, attendance fell 70 percent to 57,213, partly because of fewer racing dates. Betting on Turfway’s live races, meanwhile, fell by nearly two thirds to $78 million. In the debate over casinos in Kentucky, state politicians are generally protective of the racetracks, such as Churchill Downs in Louisville and Keeneland in Lexington. But interest in live horse racing has withered over time. Annual attendance at Kentucky’s five thoroughbred tracks has fallen 11 percent since 2005. On-track betting on live races has fallen 30 percent. And on-track betting on races televised from other tracks has plunged 45 percent. Josh Gilliam, 37, of Louisville, for one, has never bet on a horse. But newfangled ways of betting on horses have offset some of the decline. At the Kentucky Downs racetrack in Franklin, above the Tennessee line on I-65, more than $325 million was bet in 2014 on so-called “historical horse racing” -- slot machines that replay actual horse races from the past. The Kentucky Downs slots, popular with Nashvillians an hour south, took in almost triple what people bet on live races at all eight Kentucky racetracks combined in 2014. 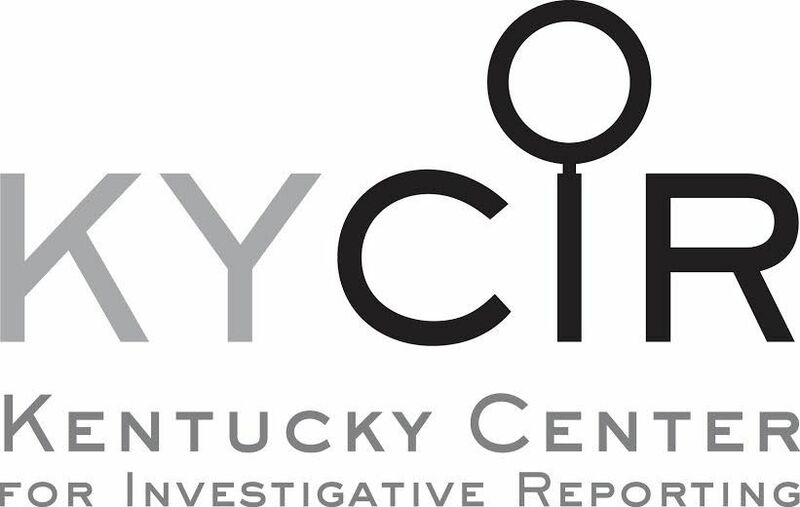 This article was produced by the Kentucky Center for Investigative Reporting, a new nonprofit newsroom from Louisville Public Media. You can read more at kycir.org. Betting on horse races on the Internet is also big in Kentucky now. According to the Kentucky Horse Racing Commission, Kentucky residents placed $160 million in such bets in 2013, the latest data available. To be sure, attendance and betting volumes at the offshore river casinos have themselves fallen significantly over the past decade. Still, the wagering and tax generation are so torrential that some Kentucky officials and racetrack owners want a piece of it. Churchill Downs Inc., the parent company of the namesake track, favors casinos in Kentucky. Soon it will draw more revenue from its casinos than its racetracks. Casino envy explains much of the national snowball effect in gaming in the past 25 years. Illinois legalized casinos in 1990, prompting Missouri to follow suit. Mississippi’s casinos nudged Louisiana into the game in 1993. Indiana’s casinos led to competition in Michigan and Ohio, just as West Virginia’s and New Jersey’s did for Pennsylvania. And on and on. Kentucky’s entire northern perimeter touches states with casinos. “All of the states that legalized casinos made the argument that they were losing tax revenues to the neighboring state,” said Lucy Dadayan, a senior policy analyst at the Nelson A. Rockefeller Institute of Government in Albany, N.Y.
Kentucky, though, can’t get past the debate stage. Efforts to legalize casinos have stalled in the legislature, most recently in 2014. Backers, both in the public and private sectors, point to the Spectrum Gaming study and its estimates of $1.1 billion in first-year gross revenue, 11,000 first-year full-time jobs with a $289 million annual payroll, nearly 10,000 indirect jobs and 4,300 construction jobs. Opposition comes from a number of segments. Many in the equine industry fear economic harm to horse racing. Others cite the high social costs of diverting household income away from essentials such as food and shelter. Martin Cothran, senior policy analyst with the Lexington-based Family Foundation of Kentucky, also cited the detrimental effects on small businesses. Twice a year, the La Grange Rotary Club Foundation runs a Texas Hold ‘em poker tournament to raise money for Oldham County charities such as Hope Health Clinic and Habitat for Humanity. Until January 2014, the games were held in Kentucky, but because the state limits tournaments to six hours and forbids hired dealers, the club moved the fund-raiser to Horseshoe Casino. The Rotary Club raised $13,000 at Horseshoe last year, he said. The tournaments last about 10 hours. 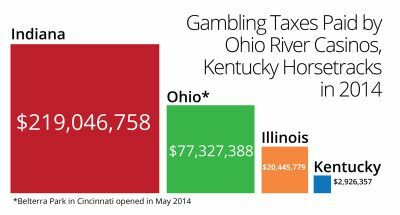 Unless -- or until -- Kentucky legalizes casino gambling, state residents will continue to drop colossal sums elsewhere, mostly on the other side of the Ohio River. Beshear said he sees “no real push” for a casino bill by legislators or the horse industry in 2015, his last year in office. In other words, the estimated annual tax receipts of $465 million or more from Kentucky casinos will remain a fantasy for at least another year. There is no foreseeable casino tax windfall to help restore the $17.8 billion deficit in the state pension system or to help cover the $2.6 billion tab for a new I-75 bridge into Ohio. Even from the Kroger parking lot in west Louisville, Suzanne Lamberson sees the irony of Kentucky’s casino ban. Thousands of Kentuckians drive across bridges every day to play slots in Indiana and cards in Ohio and Illinois. 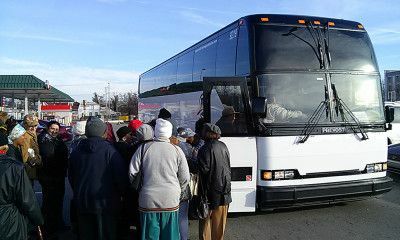 “If they want the money to stay here in Louisville, then they need to put a casino here,” Lamberson said before stepping aboard the Horseshoe shuttle bus. Reporter James McNair can be reached at [email protected] and (502) 815-6543. Ethan Smith contributed to this report. Patrick Smith created the interactive wagering graphic and chart. Top photo: Darlie Lowe, right, and Deneen Crayton, both of Louisville, wait for the Horseshoe Southern Indiana Casino shuttle bus on a recent Wednesday morning in West Louisville.